Anatomy of an Online Course: Inoreader: Keeping Up With All Those Blogs! Inoreader: Keeping Up With All Those Blogs! It was my great good fortune to learn about Inoreader right at the beginning of the semester; it's made working with the student blogs so much more fun than ever before. I'll be making changes to my course for Spring semester so that I can make even better use of that tool. Meanwhile, in this post, I'll start explaining how I am using Inoreader in my classes for Fall 2014. BRIEF DESCRIPTION. Inoreader is an RSS reader with some very powerful features that allow me to keep up with hundreds of student blog posts each week. In particular, I am making use of the rules, tags, multiple display views, and HTML clippings. Rules are a "Plus" premium feature ($30/year), but all the other features are part of the free version. 1. Add Blogs. As the students create their blogs, I grab the RSS to add the feeds to Inoreader, with each class in a separate folder. OU IE is my Indian Epics class; OU MF is my Myth-Folklore class. As you can see, this gives me easy access to each student's blog when I am interested in looking at a given student's blog as opposed to looking at a collection of blog posts for a given assignment. 2. Create Rules. 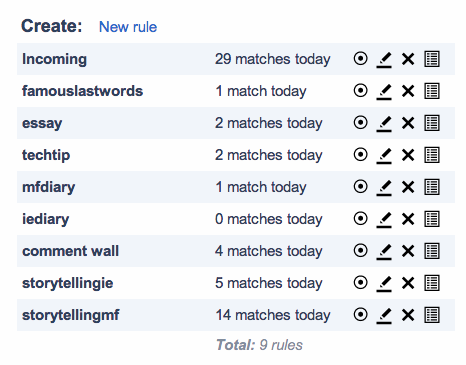 I set up rules to tag the incoming posts based on keywords in the subject lines. So, for example, storytelling posts in my Myth-Folklore class are tagged storytellingmf, and the HTML clippings feature lets me share posts with that tag. And that's all, folks! For those of you who are users of rules and tags to organize your email, Inoreader is allowing me to use exactly the same organizational strategies. At the same time, it provides powerful sharing opportunities because each tag has its own RSS feed and its own HTML clippings service. In other posts, I'll explain more specifically some of the ways Inoreader is helping me with each of the different types of assignments which the students are publishing in their blogs. Just how I interact with the students' blogs and how the students interact with each other varies from assignment to assignment, and Inoreader is helping provide access, both for me and for the students, to the different assignment types. HISTORY. I started out years ago using Bloglines for student blogs, and then for five years I used Ning, a group blogging platform; you can read more about that history here. As far as RSS readers go, I was a loyal fan of Google Reader, and I made good use of "bundles" then. I switched to Feedly when Google shut down Reader, but I missed my bundles! I put out a plea for help at Google+ when I realized how badly I needed something like Google Reader to manage all these new student blogs, and Stefan Heßbrüggen recommended Inoreader. I am lucky to be connected to so many smart folks online; Inoreader was exactly what I was looking for. Blog awareness. I am able to skim and scan, getting a good sense of all the blog posts as they come in. Blog organization. I can review the different types of blog posts systematically, learning from the posts, commenting, and also re-using them. Blog sharing. Being able to share the blog posts so that the students can get ideas and inspirations from each other is the best thing of all! One thing I like about my admittedly lazy use of hosted options is that it means I can share my strategies with everyone! Anything that I am doing in my courses, my students can turn around and do too, and I can recommend my strategies to anyone with an Internet connection and some time to play around with these hosted tools and services. Of course, I know that no hosted service will last forever, and in the past ten years, I've seen services come and go, including dearly beloved services like Delicious and Google Reader. But I've also come to learn that sometimes the demise of a beloved service is what galvanizes change, in a good way. It was the demise of Delicious that prompted me to create my eStorybook Central archive of student work, for example, whereas before I had done that with Delicious; eStorybook Central has turned out to be much more useful to me as a project archive than Delicious ever was! Likewise, the end of Ning threw me into a bit of a panic, but it has provoked the biggest and best changes that I've ever made to my courses. Of course, at the moment I am hoping that Inoreader sticks around for a very, very long time — and I can tell there are still lots of Inoreader tricks I have yet to learn. I am so excited about tweaking my assignments next semester in order to take full advantage of Inoreader's powerful help! Thanks for sharing this Laura!